I'll get back to the River Festival in just a second, but first let's talk about our great mystery from last week: the etymology of veins of gold. I asked my linguistics professor about it, and he said that the phrase actually came from Marinthian mythology rather than Anumite. I didn't dare ask for any further clarity lest I arouse suspicion that I have an interest in flimflam, but I sure wanted to. The Marinthians and Anumites both believing their gods had golden blood is a most interesting coincidence. In my very first entry I mentioned that there were similarities in tales of magic from cultures thousands of miles apart. Now we can add golden blood to that list. I'll explore that more later when I have time to delve into the full mytholgy of Marinth, but for now, let's pick up where we left off with the golden bracelets. Yes, they symbolized Tukamen's golden blood. But they also had long-lasting consequences for those involved in the festival. If they were fake...well, that was one of the highest crimes a person could commit. It simply wasn't done. But on the few occasions that it was, the perpetrator was promptly branded, castrated, and sent to the mines. ...until she entered Alqari's Canal. The giant scorpion pulling her chariot was twice the size of any I'd ever seen, and the chariot was made of solid gold and adorned with enough gems to buy three armies of slaves. But the beauty of the chariot was nothing compared to the beauty of the woman riding on it. Her hair was spun with gold and pulled into a tall mohawk, her ears were adorned with the finest sapphires, and her white linen dress was impossibly thin and delicate. I heard one woman nearby remark that she would not be surprised if it was Ankti herself. Indeed, the flawless features of the mask of Ankti had never looked so natural on a mere mortal. For a moment the entire city went silent at the sight of her. Then it was chaos. The drummers beat their drums with a vigor that had been absent since the first week of the festival. Young men yelled boasts of how they would get past this monstrous scorpion. Loudest of all though was the bookies. How many bracelets would she earn? How many men would succeed? How many would be Tukamens, and how many would be Nairos? Would the river rise during her dance? You name it, there was a bookie there willing to give you odds on it and take your money. As the woman danced on her golden chariot, gyrating her hips to the drum beat, my pulse quickened. Was this my moment? I had been preparing for the festival for years. I had spent countless hours studying statues of Tukamen and trying to craft my costume in his image. The mask had been supplied by the temple, of course, but the rest was my own creation. I had measured and cut the linen for my skirt. I'd gathered rocks and stuck them to my shoulder with date palm sap to make Tukamen's iconic stone shoulder. And I had even paid the goldsmith to let me hammer my golden bracelet into a perfect circle. Practicing to get past the giant scorpion had taken even longer. I felt like I was ready, but I had only practiced evading normal sized scorpions. Giant scorpions were an entirely different beast - forgive the pun. Their claws were the size of a man, and rather than a painful pinch, they'd snap your leg in two. Or if you were really unlucky, they'd get you with their stinger and send you on an early trip with Katra to the afterlife. But most important of all - at least, in my young mind - was the strategy of it all. How do I pick my Ankti? How do I determine which woman would end up with my bracelet on her arm? "Let Tukamen guide you," was the advice the priests gave me. But all that meant was to come up with a strategy, because that was the way of Tukamen. Hadn't the priests read any of their own stories? Whether it was business or love or war, Tukamen always had a plan. Order begets prosperity. 1. Do not, under any circumstances, go for the first woman. Whether she happened to be beautiful or not, she always had multiple suitors. Some men simply couldn't wait. Others made a tactical decision to go first in case the canal flooded and ended the festival early. Either way, going for the first woman meant likely sharing her with others, which I did not want to do. 2. Always face the giant scorpions one man at a time. This was an unwritten rule of the festival. Only Nairo would try to sneak by the scorpion while it was distracted by another man. Going one at a time also decreased the likelihood of sharing the woman, since once a man had passed the scorpion other men generally just waited for the next woman. 3. Don't pick the most beautiful woman. The more beautiful the woman, the more likely it was that you'd have to share her. So far, I'd stuck by those rules perfectly. I had skipped the first woman...and I'd skipped the rest too. My golden bracelet was still on my arm, waiting for me to find my perfect Ankti. And this woman, the one on the golden chariot guarded by the biggest scorpion in all of the Anumite Empire, was my Ankti. I was sure of it. I was just about to climb down to face the scorpion when a man across the canal beat me to it. He was huge. He must have stood a foot taller than me...until the scorpion snapped both his legs off at the knee. After the scorpion crawled over him, two priestesses of Ankti took his bracelet and carried him away on a stretcher. The next man to attempt to join the woman on her chariot got impaled by the scorpion's stinger, and the next was tossed into the wall of the canal with a lazy swing of the scorpion's claw. What happened next had never been witnessed before and I've never witnessed it again. First two men went against the scorpion at the same time, then another joined. And then another. And then another. Within seconds, at least a dozen men were all trying to get past the scorpion. And I was one of them. Yes, that went against both rule #2 and rule #3, but I didn't care. Tukamen was guiding me. I could feel it. I hung back and watched as the scorpion defended his precious cargo. He was invincible when attacked one at a time. And two at a time. And three at a time. But he only had three weapons: his left claw, his right claw, and his tail. So what if we attacked him four at a time? I joined the next group of three. His claws got the first two men, and his tail got the third. The diversion allowed me to jump onto his head unscathed. His tail whipped at me. I dodged. All my training was paying off. She would be mine. But I couldn't get distracted. I sprinted across the scorpion's carapace and wrapped my arms around its tail in the same spot you'd grab a normal scorpion. It was the one spot they couldn't reach. I looked at my prize. My Ankti. The most beautiful woman in the empire. She smiled at me and shook her hips to the beat of the drum. For just a moment I lost focus and loosened my grip, and that was the end of me. The scorpion flicked his tail and sent me tumbling to the ground. All I could do was look up from the flat of my back as my Ankti rode by on her golden chariot. The priestesses were with me a moment later. One asked if I was okay while the other slid my bracelet off my arm and added it to a bag of a dozen others. A hundred men tried to get past that scorpion, and all failed. Except for one. Some say he was Tukamen himself. Others say he was the emperor. He was of course wearing a mask, so we'll never know for sure. But what we do know is that his union with my Ankti ended the drought and brought the flood waters. I didn't become a man that year, but I can always say that my bracelet is one of the hundred on the arm of Empress Anamank. So how did that mysterious beauty go from riding behind a scorpion to becoming the empress of the entire Anumite Empire? In long...well, that's going to take a little bit longer to tell, and I seem to have run out of parchment this evening. After hours of research, I'm beginning to understand why the university doesn't teach us about ancient gods. It’s because it’s all a bunch of nonsense. I'm used to things being neat and orderly. Here at Techence, everything can be answered with equations. Need to know the third side of a triangle? Use a^2 + b^2 = c^2. Want to know the circumference of a circle? There's an equation for that too. But in the case of the Anumite gods, it feels like I'm trying to solve something without knowing any of the variables. Actually, that's not true. It feels like I'm solving an equation that has a million different answers, and none of them are entirely right or wrong. In one book Seraat was listed as the father of the gods. But then in the next book I picked up, it said he was created by Mefari, who was also his wife. Or his mother? I don't know. My favorite one is the claim that Seraat was the sun. The sun! If Anumites were so backward that they believed the sun was a god, then I almost have to conclude that they did in fact have magic. How else could such a backward society have survived? In various texts, I've seen Mefari associated with order, protection, motherhood, wisdom, and hunting. She's also sometimes referred to as the moon, which I guess makes sense given the apparent ineptitude of Anumite astrologers. I don't know what Necris did to upset the Anumites, but they really did not like her. Not a single book I encountered spoke positively about her. Words like decaying, dusty, rotten, and blackened often accompanied her name. It's unclear how many limbs she had, but it was almost certainly a number greater than four. Pretty much any time something went wrong, the ancient Anumites blamed it on Necris. As I mentioned earlier, Seraat was the father of the gods. He's associated with strength, war, fire, and the sun. 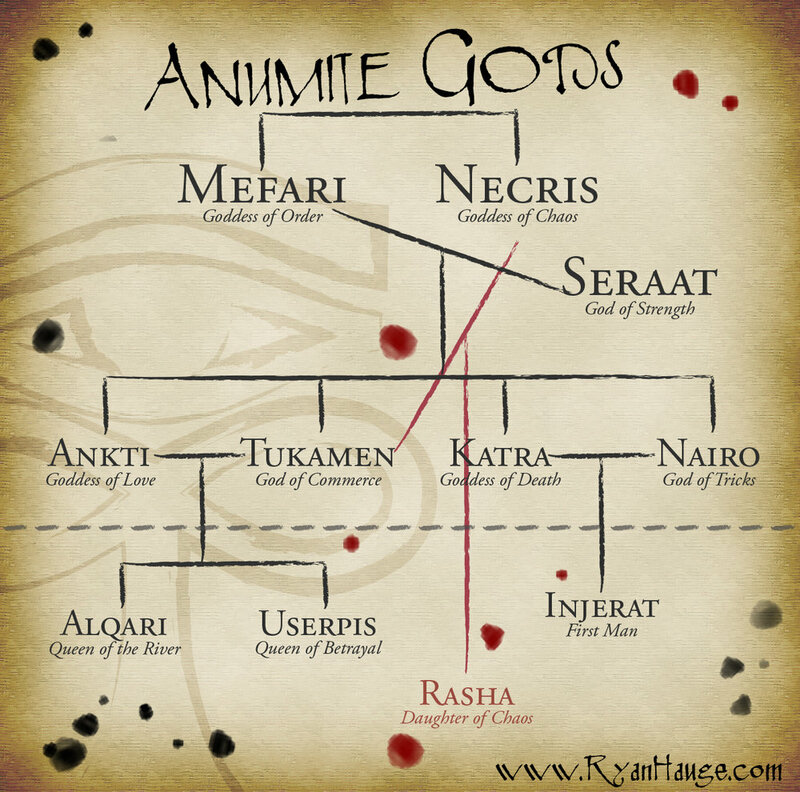 Most of the books I read said that he was created by Mefari, but a few had it switched and said Mefari and Necris were his daughters that he created uh...by himself. They went into rather more vivid detail about how such a thing was accomplished, but I'll spare you the details. Ankti was the goddess of love and fertility, which also extended to the harvest. They believed she was the Anumit River, which is of course the logical offspring from a union between the sun and the moon. Of all the descriptions of festivals in the Anumite Empire, the one that was mentioned the most was the river festival of Alqaruk. I'll already get banished if the ministry finds this journal, but if I include a description of the river festival, I'm worried I'll be labeled as a pervert too. Perhaps I'll write about it later if I determine that it's crucial to our understanding of magic. I'm sure you're familiar with the mountain range to the east of the Rashid Desert called Tukamen's Coffers. Based on that, a logical person might deduce that Tukamen was the god of prosperity, commerce, and mountains. And surprisingly enough, they'd be right. It's nice to know that at least some of the information about these gods makes a little sense. The third child of Seraat and Mefari was the goddess of death and cats. Why are those two things related? I have no idea. If I hadn't seen it in more than one source, I would have been inclined to think it was a strange joke written by an Anumite historian who happened to be allergic to felines. Either way, despite her association with death, none of the books spoke ill of her the way they did of Necris. Nairo is an interesting one. He was the god of tricks, infertility, and the desert. Before I go any further, I should mention that Anumites hated infertility. Castration was the punishment for anything worse than steeling a loaf of bread. And the government kept track of its citizens' fertility. Any married couples determined to be infertile were sent to the mines for hard labor. And yet...many books that I found spoke very positively about Nairo. At first I couldn't reconcile this, but then it hit me. What if his tricks were actually magic tricks? If so, I wonder... Did the anumites perhaps tolerate his infertility because he also gave them the gift of magic? Or were they scared that he would wield his magic against them if he did not receive proper worship? Or finally, what if the stories of Nairo's tricks and infertility existed as a warning that the use of magic could cause infertility? No one knows the exact number of tribes and cultures that inhabited Pentavia thousands of years ago. Some historians estimate it was hundreds. Others say it was thousands. With a lack of written records, we'll never know which is correct. Some cultures were reduced to a blood-stained footnote on the pages of General Marcus Turin's famous book, Taming Pentavia. Others didn't even receive such a courtesy as they were trampled by the marauding horsemen of the Shield. Up north, the clans of Fjorkia were as harsh and unyielding as the snow-covered mountains they called home. During their short summers, the women would tend the fields and pray to Grognard for a good harvest, while the men would fight wooly dragons, defend their lands from two-headed ogres, and raid their neighbors for food, weapons, and women. Fjorking warriors were known for their ferocity, and they never backed down from a fight. After all, they viewed every battle as an opportunity to die with honor. But they weren't foolish. During the winter, when the snow fell in sheets and the wooly dragon bulls went into musth, the Fjorkings gathered in the safety of their caves and didn't emerge until dragon mating season was over. To the southwest, across the Tujiran Sea, lay the hot, rocky islands of Marinth. There were no wooly dragons for them to contend with, but they had their fair share of challenges in the form of natural disasters (or as they believed, punishments from their vengeful gods) and rival city-states. Despite that, Marinthian culture thrived. Their shipbuilders made triremes that could cross the sea, their generals devised tactics still used today, and their philosophers went on to found the very university I'm sitting in as I write this journal. Finally, to the east in the Rashid Desert lay the Anumite Empire. They were the oldest, longest lasting, and perhaps most impressive of the three early civilizations. Historians credit their early advancement and longevity to a fortunate combination of factors. The desert protected them from invasion, while the annual flooding of the Anumit River replenished their soil with the nutrients required for agriculture. The Anumites wouldn't dispute that they had these advantages, but they would dispute the assertion that they were a "fortunate combination." In their eyes, nature was a gift from the gods. Before I go any further, I would be remiss to not make note of the proverbial elephant on the page. 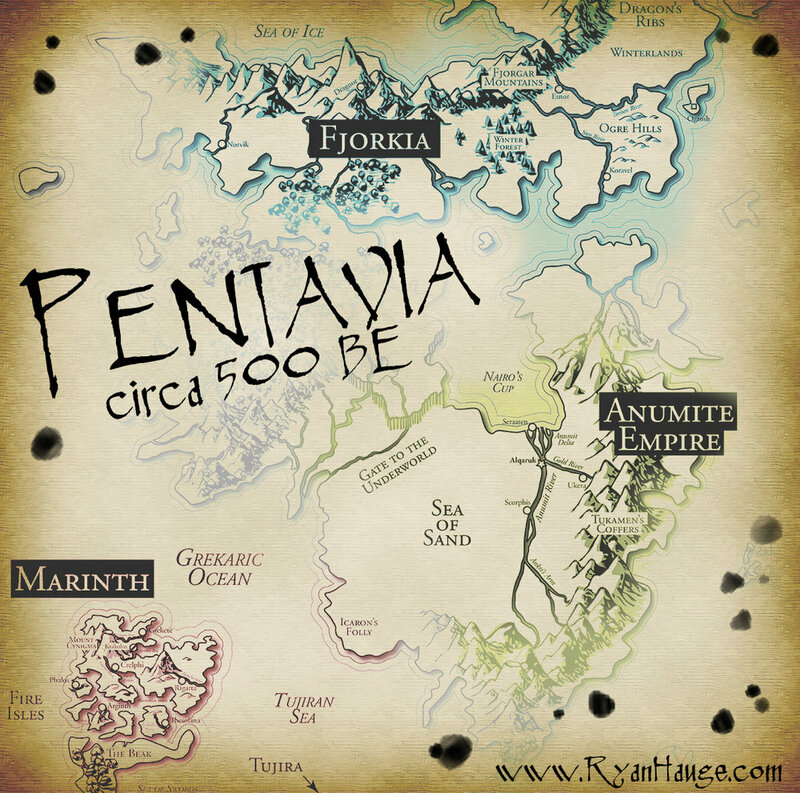 If you're wondering why humans chose to settle in some of the least hospitable parts of Pentavia, you are not alone. The farmland of Treland is the most fertile on the continent and the weather there is the most moderate and predictable. And yet...the Fjorkings chose not to travel south even to avoid the wooly dragons and harsh winters. And the sea-faring Marinthians suffered through earthquakes and civil war rather than crossing the Tujiran sea and settling on the trade coast. What was in the forests of Treland that kept people away for so long? That's one of those little bits of history I mentioned that doesn't quite make sense without the existence of magic. Or at least...magical creatures. More about that later, but for now, I'm going to learn everything I can about the Anumite Empire. If magic exists, perhaps it was a gift from their gods.